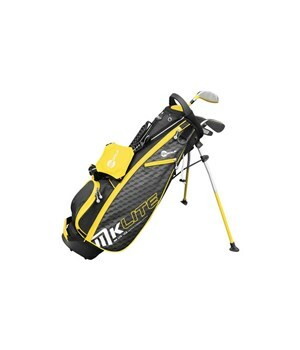 The MKids Junior Lite Half Package Set has been specifically designed to enhance a junior golfer’s swing by using the correct weighted and sized clubs. Made from high spec materials the configuration in this half set offers just the right number of clubs for a junior to get started playing golf or progress on to the next size. Fairway Wood - This high lofted fairway wood features an oversized construction that allows you to use comfortably and confidently from the tee or fairway. Irons - The oversized head and large cavity design provides incredible levels of forgiveness on off-centre strikes. The CG is low and deep in the head to improve launch for increased distance. Putter - The design of the head promotes stability throughout the stroke for greater distance and accuracy control. All of the shafts (except the putter) have been fitted with a high quality graphite shaft that has been weighted specifically to enhance and help the junior golf swing. A stylish stand bag completes the package set, the design of this stand bag will allow you to comfortably carry the clubs around and provides excellent storage room for any extra layers of clothing and all your accessories. Top size: 8" x 6"